Day two in the Nevada desert, and the NAB Show is up and running at full speed. My focus today was post-production content editing software. The big players here in the South Hall are AVID and Adobe Premiere, with a field of smaller companies having set up tent as well. Notably absent from the floor as usual is Apple and its content editing software platform, Final Cut Pro X.
I began digital storytelling at Voices & Visions Productions using AVID on a Power MAC 9600 in the late 1990s. I was an avid AVID user until about eight years ago when I switched to Final Cut Pro 7 based on advancements that system offered, so I was curious to spend the first part of my day today at the AVID exhibit. 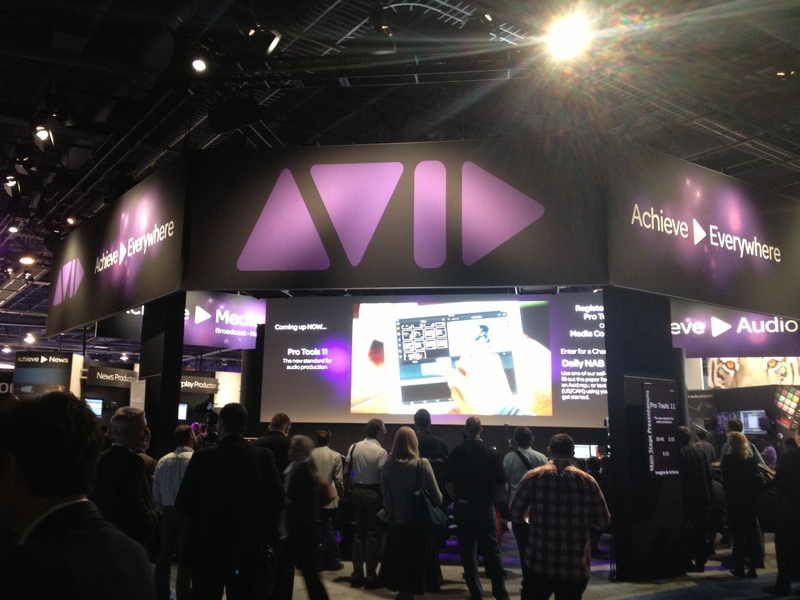 AVID has a proven track record of innovation. Many of the content producers here still recognize it as the industry standard. Traditionally manufacturers use the NAB venue for making announcements about their latest upgrades, and AVID did not disappoint, announcing audio and performance upgrades to its arsenal. Enhancements include a fully redesigned audio engine with a new 64-bit architecture, expanded metering and a direct HD video workflow. The new technologies are successfully luring back some former AVID editors who, like me, had made the switch to Final Cut Pro 7, but fell off the Apple cheerleading squad when the FCP X (ten), less professional-friendly system, was introduced two years ago. The FCP X launch took place in Las Vegas at the same time as the NAB, but in a separate venue (sigh), and was met with a cool reception. Among the devoted FCP 7 users with whom I have been chatting this week, there are some who have switched away from Apple’s FCP platform, others who are still considering alternatives to FCP X, those who have decided to embrace it, and a group who takes the approach of fluency across all systems. 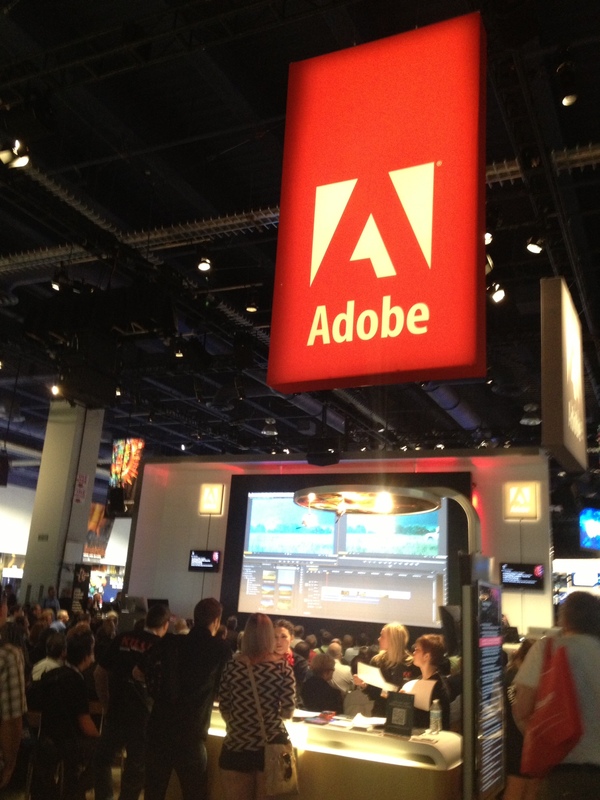 Adobe’s exhibit are on the South Hall lower level at this years NAB Show. Following the tradition of announcing new innovations at the NAB, Adobe introduced Adobe®Anywhere, a collaborative workflow platform that enables editors using Adobe professional video tools to work together, allowing access and management of centralized media and assets across almost any network. This program works well with the Adobe Cloud introduced last year, which allowsusers to access all of the relevant software for one monthly fee. Updates are free, and the workflow is fully integrated, making content flow seamlessly streamlined. Adobe’s price structure for the package makes it a creative powerful suite of production tools worth considering. Tonight is the Final Cut Pro Users Super-Meet. The event is an evening long gathering of some very creative storytellers exploring the latest innovations and industry trends. This entry was posted on April 10, 2013 at 8:33 am and is filed under Business Video, Corporate Video Production, video production. You can follow any responses to this entry through the RSS 2.0 feed. You can leave a response, or trackback from your own site.